I think the longest I've ever gone on vacation was one week and that was back in high school for senior week. Typically when I pack, I pack a lot. I could be going away for just one weekend and pack like I'm traveling for an entire month, but hey I need my options you know? This was my first time traveling out of the country and I'll be away for two weeks so ultimately you'd think packing would become a nightmare. Nope, not this time! I managed to pack light, aka reasonably, so I thought sharing some tips on how to pack light from the master over-packer would be great. Almost half of the items I packed I'll be wearing more than once. It just makes packing so much more easier and that way your suitcase isn't flooded with clothes. I use to be so anti double wearing items, but I've learned to stop being so dramatic about it. Surprisingly I probably could have downsized my suitcase with all the room I saved with less clothes. 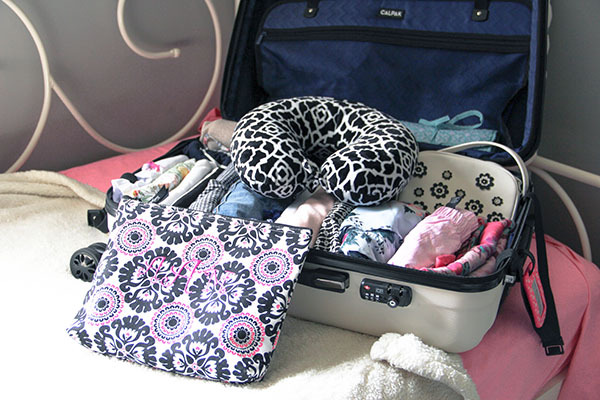 Another tip: roll up your clothes when putting them in your suitcase--saves so much room! Two pairs of shoes?! That's insane. But seriously, pick your most worn dressy sandals and your most worn casual shoes and be done with it because shoes can take up the most space in your suitcase. I tried on every single outfit I took on my trip, made sure it went with the two options of shoes I packed and paired it with jewelry. That way you're not packing anything extra! Also planning out your outfits helps you to get a vision of what accessories work best so you're not packing every necklace, bracelet, etc. you own. Also make sure you have a sense of what the weather will be like where you're going. I'm going to three different locations, two will be in the 70/80's and the third in the 50/60's, so I knew ahead of time that I had to basically pack for two different seasons.